AUSTRALIAN wool prices reached record levels again this week, driven by strong competition among buyers from China, India and Europe. The AWEX Eastern Market Indicator rose 99 cents, the largest daily rise since 2002. “This increased the EMI to 2089 cents, easily surpassing its previous high of 2073 cents, set in June of this year,” AWEX senior market analyst Lionel Plunkett said. Currency movement, a reduced offering and buyer concern over upcoming supply have all contributed to producing a remarkable week, he said. The EMI in $US increased 56 cent to 1537c/kg clean as the $A-$US exchange rate fell US1.76 cents during selling. “Quantity reduced to 36,302 bales and from the opening lot buyer competition was intense. “On the first day of selling, prices across the nation increased by an average of 110 to 160 cents,” Mr Plunkett said. “The rises were realised across all microns and over the entire facet of types. Mr Plunkett said the second day of selling was more subdued than the previous day, although the market continued to track upward, just not at the same frenetic pace that was witnessed on day one. “All types and descriptions generally rose by another 20 to 50 cents, pushing the EMI a further 27 cents into unchartered territory. Mr Plunkett said the regional market indicators, and the individual micron price guides (MPG) for 18 through to 21 micron, rose to unprecedented levels in all three selling centres. Mr Plunkett said the crossbred sector also posted significant gains of 60 to 90 cents. A limited offering of oddments generally rose by 40 to 80 cents. Australian Wool Innovation’s weekly market report said the appreciation of the EMI in $US fell short of matching the record level of US1540 set back in the first week of June 2018. “Interesting to note that the $A EMI was then over a full dollar lower at 2011 cents, giving rise to the benefits of the lower $A rate against the $US in extracting Aussie wool growers more of their local currency whilst overseas buyers pay the similar price, which gives rise to more sustainable pricing at these levels. AWI said this week fresh business being written at full market price was openly discussed on show floors for China, India and Europe. “The ensuing levels though took all participants by surprise as the physical market eventually doubled the most significant of gains that were expected. “Competition could only be described as being of a most aggressive nature, but surprisingly there appeared to be no perceived evidence of any so called “panic buying” which is usually associated with rises of such magnitude,” AWI said. 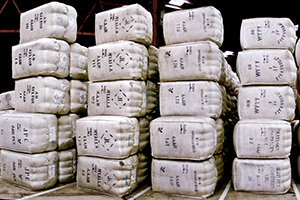 AWI said although it is “clearly established” that improved demand for wool had taken the EMI from 955cents in August 2012 and through the 2000-cent mark in just six years, the lack of global supply is now accentuating that already entrenched increasing value. “A startling offering scenario is firmly in buyers’ minds, as already this season there has been a 14pc shortfall in bales sold to the trade compared to the first four weeks of last season. AWI said European buying became even more evident this week and again was leading the market on the better specification types at the finer end of the Merino offering. Fremantle has a recess in Week 8, which has contributed to a further reduction in the national quantity. Currently, 29,813 bales are on offer in Sydney and Melbourne during the annual Wool Week.